The apply rate for job ads is one of the most important recruitment metrics. An average of 11 people who visit your job ad end up applying. 11% convert and the rest of the 89% leave. But I’ve seen the apply rate pop up to 60%+ with the right tweaks (see below). Many job titles are too long. Many women only apply to a job if they meet 100% of the requirements. Men? They apply if they meet 60% of the requirements. (see tip #1 from 5 Free & Easy Tips for Recruiting More Women). If the requirement is only a nice-to-have, then say so (e.g. you can soften your must-have language to nice-to-have language (e.g. “bonus points if you have…”)). Ongig, TheMuse, Textio and others point to word count as a key way to boost the apply rate of your job descriptions. Review all of your existing job ads and flag the severe outliers: any that have less <100 or >1,000 words. You’ll learn a bunch from reviewing outliers that will help optimize the outliers and perhaps the others too. The first thing on a job ad that candidates look at is your salary info (if it’s included), according to this Job Description Heatmap. Tip: Include whatever salary information you can (this can be $ details if that’s your style or you could include a 3rd party salary estimate source (Ongig offers the optional Glassdoor salary widget that gets automatically added to every one of your job postings if you choose). Apply Rate Booster #6: If You Have a Short Apply Process, Flaunt It! 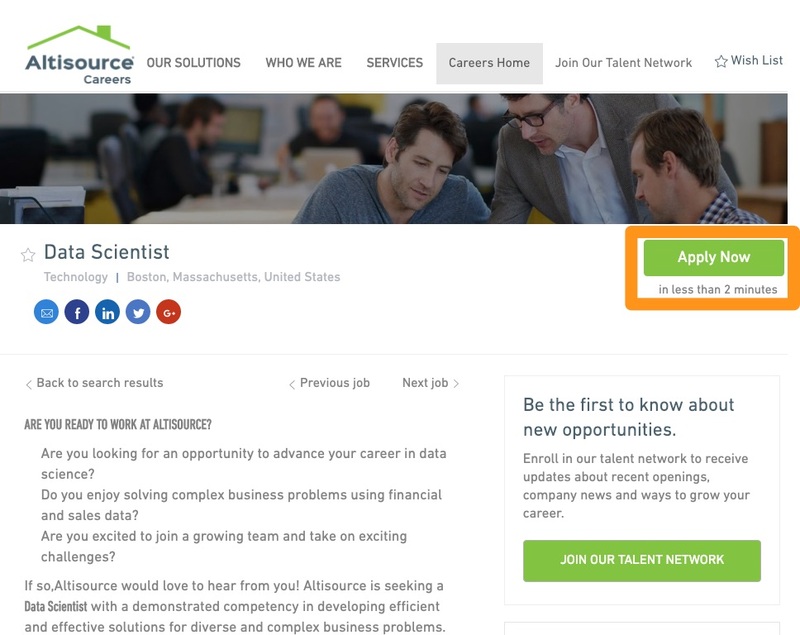 Check out Altisource’s job below: their candidates now apply in “less than 2 minutes”. Candidates love when you can save them time. Tip: If you have a short apply process (including a single-click apply), then highlight it on your job descriptions. When a candidate visits your job page from a job board, they should see your complete header (either your corporate one or a special careers header you created). Unfortunately, many candidates visiting from a job board see a mostly-empty header (the default header that most ATS’s offer). That leads many candidates to bounce off your page to go look for more info about you. Once they do that, you might lose them. Tip: Include your corporate or careers header on every job page. It sounds obvious, right? You should mention the benefits of working at your company. The more benefits you list (in your job ads) the higher your apply rate (7.4% for 0 benefits, 8% for 1+ benefits, 11.5% for 2+ benefits, 17.1% for 3+ benefits and 22.5% for 4+ benefits, according to Appcast). There are words or phrases that some consider offensive. I call them “exclusionary words”. It might be an inadvertent mention of words with gender-bias (guys, salesman, man-hours). Or perhaps it’s an older phrase about people with disabilities (e.g. there are still job postings that mentioned phrases like “crippled” and “retarded”). Exclusionary words lower the % of candidates who have a favorable view of you. And that lowers your job ad apply rate (and your quality of hire). Check out A List of Offensive (Exclusionary) Words Used in Job Descriptions for examples and recommended synonyms. The best candidates prefer to read job ads that are in Plain English. There are so many great writing tools out there (see 5 Free Tools to Write Better Job Descriptions). 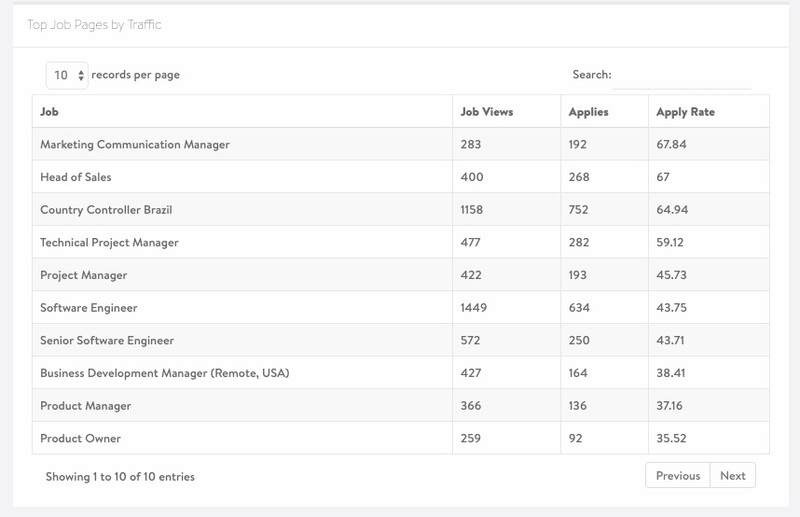 I love talking about recruitment metrics and how to optimize them. Apply rate is a favorite of mine because it takes so much effort to get good candidates to view job ads. I want to make sure you get as high a % of the good ones to click apply as possible. I know that doing 10 new best practices is a lot. If you’d prefer to let Ongig’s new Text Analyzer do this heavy lifting for you, please give me a ping.